We all arrived between 10.30- 11.00 at Steve and Dot's, the group were Dave and Kate, Stuart and Lucy, Angus and Shirley, Bill and Mavis, Bill and Isobel, Martin and Sue and Tony and myself, Sheila. We had a coffee before we were given our routes, it was interesting to observe the "girls" admiring Dot and Steve's daughter's wedding photos and the " boys" admiring the repair work on Steve's car following the damage, to the body work, caused by golf ball size hail stones. After coffee and a chat we left, keen to follow the instructions and find out where we were going! After a bad start, going wrong very early, Tony and I then thought we had "cracked" the instructions but, after 45 minutes, realised we were hopelessly lost we decided to return to Dalton, had a drink, and awaited the others! Dot was busy preparing the food and we talked to Kevin and Helen, new members, who had arrived for the BBQ [Kevin opted out of the run because of an injured arm]. 1. Confusion started quite early, as we were heading in one direction, Tony and Sheila were coming towards us in the opposite direction!! So all turn back into Dalton .It seemed RIGHTS should have been LEFTS and vice-versa. More trouble at another junction, we turned left and others turned right--wrong again!! Got back on track and then got snarled up with a tractor convoy in Cotherstone! All good fun and we finished with lovely BBQ. We will be back next year. 2. Too many places beginning with B! Where/what was Deerbolt (I have been to Deerbolt, but not as an inmate, does any member admit to being incarcerated there in their youth? That should give you a clue – Ed) Didn't matter that some LEFT/RIGHTS were wrong -Shirley always gets them wrong anyway-so we ended up right[correct]! Very enjoyable route in unknown territory for us; just glad we had an OS. Map! 3. Most enjoyable-scenery lovely especially the reservoirs. Conquering the deliberate mistakes was fun. The buffet Steve and Dot provided was amazing. 4. First instruction a bit dodgy-but then dramatically improved- going to revisit area and find out where Hannah Hauxwell resided. 5. "Great Start" to another run on roads we had never been on. All being told to turn left at No.3, on the direction sheet, we all went up the single lane track, to the horror of locals on a quiet dog walk, we all had to do an abrupt U-turn as the LEFT should have been a RIGHT turn. We continued at various points waved to other members going in the opposite direction--arms waving and faces looking bewildered .We finished the run never sure whether to turn RIGHT or LEFT! 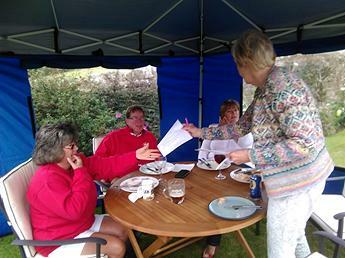 We got there in the end and all told had a good laugh with wonderful scenery and a fantastic Barbie to finish. 6.Really enjoyed the run in the immortal words of Morecambe and Wise "All the information was there just not necessarily in the right order" It took me back to the early days of the car club and the dodgy directions, however, the food was another matter wonderful, excellent ,marvellous and fantastic. 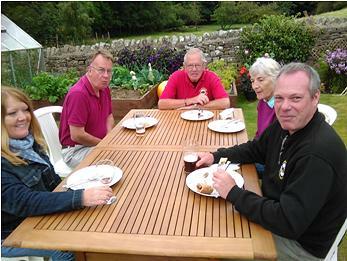 Thank you to Dot and Steve for a great day out and BBQ. As you can see we all had a marvellous time, Sheila. Thanks again Steve and Dot for an excellent event.